Christmas scares me to death. I have nightmares about forgetting to buy Christmas presents and having to rush out on Christmas Eve and buy presents at the gas station. There is so much stress on me as a mom to not only make Christmas special for my children, but MAGICAL! How the heck am I supposed to do that without totally blowing the budget!? That is why I start planning, sewing, and even buying in July. When December finally does roll around, I can relax and enjoy the season. Plus I just had to have this super cute flannel when it arrived at my shop the other day! Pajama pants are the easiest thing to sew in the entire world! 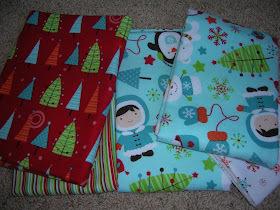 So if you do wait till December 24th to start your Christmas sewing, no worries, these come together in no time at all. The first thing is picking out your fabric. 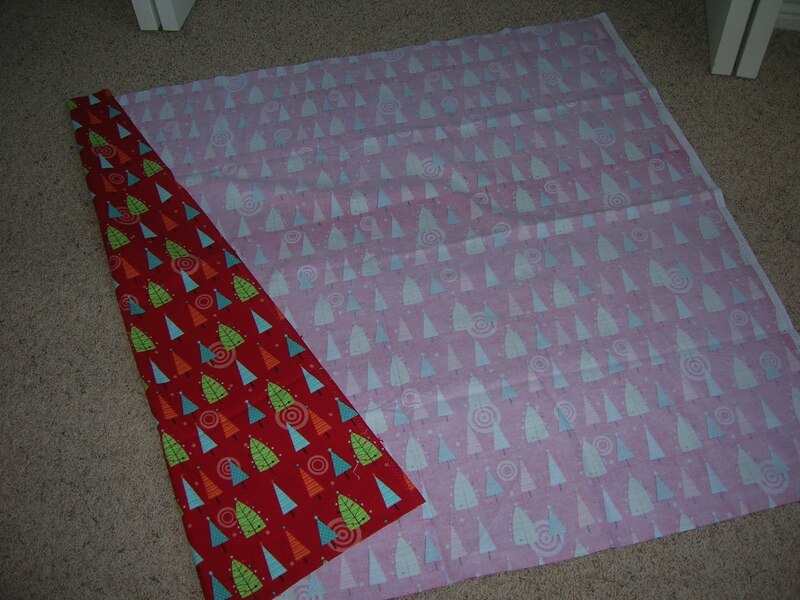 I chose this darling flannel fabric by Riley Blake Designs called Colorful Christmas. 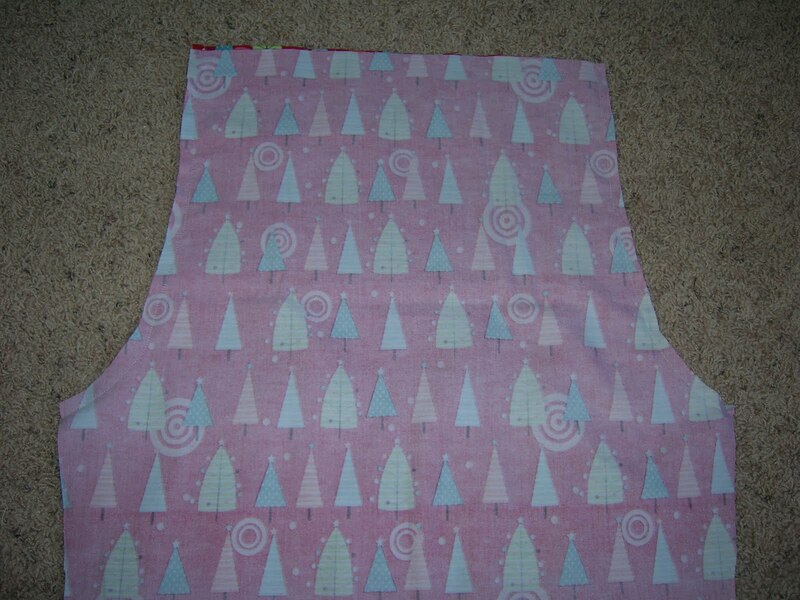 This tutorial is for up to a size 8 kids, any bigger than that and you'll need to buy a lot more fabric. But for little kids you can get away with just buying the length of their legs. 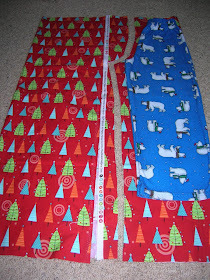 So measure your child's legs, add 4 inches for your waist band and bottom seam, and buy that much fabric. For my 6 year old daughter I bought 3/4 of a yard, and for my 8 year old son I bought 1 yard. For my 3 year old (pants not shown, because they are not sewn yet) I bought just 2/3 of a yard! Next, you'll need to get some pajama pants your child already has. These will be your template for your new pants, so pick some that fit pretty well. If you're like me and you are using last year's Christmas pajamas, just add a couple inches to the bottom so they will fit next year. Open up your fabric (as you can see, my salvage end is now running along the right hand side), lay it right side down, and then fold the sides in till they meet in the middle. Take the pajama pants you already have and fold them in half, nice and straight, and pull the crotch out into a nice point in the back. Make sure you fold it smoothly, you may want to pin to get it just right and so they don't move around on you. 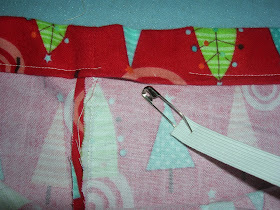 Line up the long straight edge of your pant leg with the FOLDED side of your fabric. Then cut, giving yourself at least a half inch (as you can see here I gave myself about an inch) along the other side of the pants. I cut the pants a few inches longer in the leg knowing by Christmas he'll grow quite a bit. Also, be sure and give yourself at least 2 inches extra on the top for your waist band. and sew just along that curved edge on the top. Start at the top of the curve and follow it down and off the side. Do not sew along the straight edge of the pant legs yet! 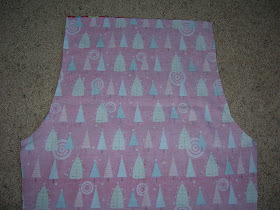 Hopefully you can kind of see in this picture, I just sewed along that curved edge and stopped. Repeat it with the other side, just that curved edge on both sides. 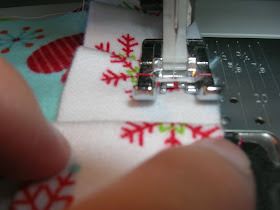 After you have that part sewn, open them up and refold them like in the picture below. 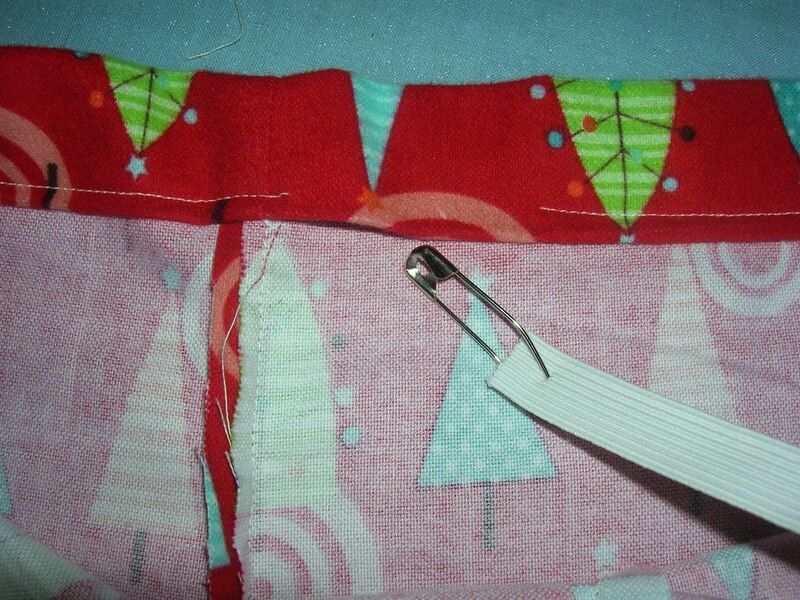 Line up your two sewn seams on the top of the pants, making sure they are centered. So basically, instead of those two curved edges you just sewed being on the sides, they are now the front and back seams of your pants. Now you are going to sew up the legs and the crotch. Start at the bottom of one of the legs, sew up the leg, around the curve of the crotch (see picture below) and down the other leg. Now they are starting to look like pants, huh?! All you have left to do is sew your waist band and bottom cuffs. Turn your waist band down 1 inch, twice. Press your seam. You can pin if you like. 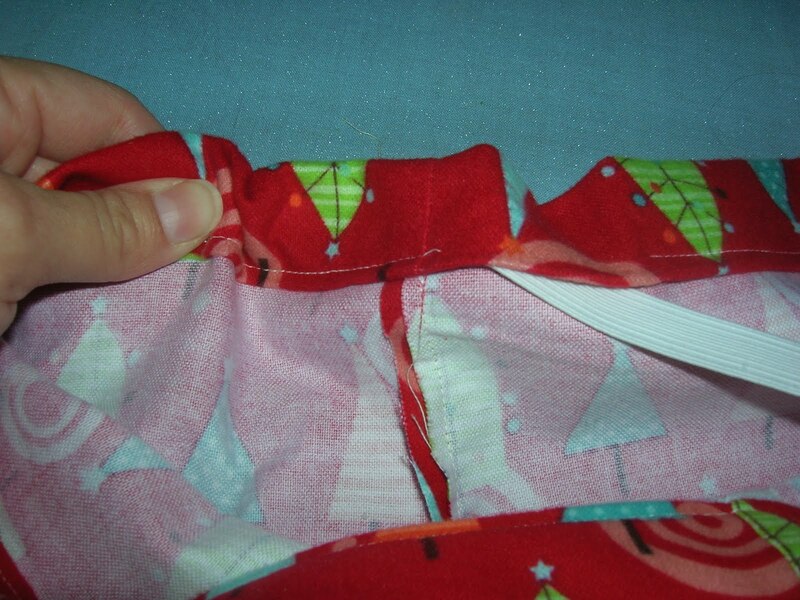 Sew with a 1/4 inch seam allowance around the bottom of the waist band (see picture) and leave a gap about 2 inches wide to feed the elastic through. I used 3/4 inch elastic. Measure how much elastic you need for your childs waist by wrapping the elastic around their waist before you insert it into the pants. An easy way to feed that elastic through is to use a safety pin on one end. That way you can feel it as it goes under the fabric and around your pants. Keep feeding it through, inch by inch, till you come out the other end. Make sure you don't lose the end of the elastic inside the pants. You may want to safety pin that to the outside of the pant leg so it doesn't get lost inside. Insert the elastic all the way into the waist band and sew up the gap. Next, fold up the bottom of each pant leg an inch, twice, like you did the waist band, and sew that down to create the hem of your pants. To make the cute ruffle on the girls pants I skipped that last step and instead took a strip of contrasting fabric, 3 inches wide and width of fabric long (so about 44 in long), and folded it in half the long way and pressed the fold. I then lined up the raw edge of the ruffle and the bottom raw edge of the pant leg and sewed it in place, making pleats about every inch. You will not be turning the bottom of the pant leg up 2 inches like you do when making a cuff, so you will want to make your ruffle pants about 1 1/2 inches shorter than the cuff pants. Once you have the ruffle on, go back up this tutorial to were you sew along the leg of the pants and finish that step. Then continue on with the tutorial, and when you are finished, you will have a cute little ruffle along the bottom of each leg. That's it, you're done! You now have a very special present for your child this Christmas, or in our family's case, the night before Christmas. P.S. 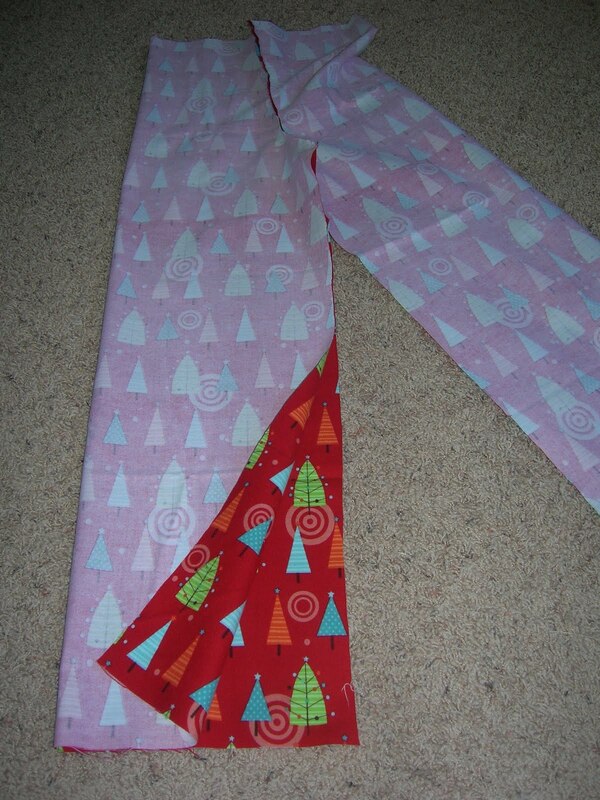 The fabric for these pants was purchased at Pine Needles at Gardner Village in West Jordan Utah. By far the cutest quilt shop around!!! You can also see them on display there, until I take them down and wrap them up for my kids right before Christmas. HEY GIRL, I COULD NOT HAVE GIVEN BETTER INSTRUCTIONS IF I WANTED TO! YEAH FOR YOU. I HOPE YOU ENJOY THE PATTER I SENT TO YOU LAST WEEK. I HAD FUN WITH IT AND HOPE YOU DO TOO. I used your tutorial to make my daughters some adorable and super easy PJ pants! Except, I screwed up on the first pair, so I was short a little fabric - so I made a contrasting waistband and ruffle :) Thanks for this!!! I love the tutorial! Thank you!!! After reaching an impasse with a ridiculously bad pattern, I found you. You saved our Christmas (Eve jammies). Thank you! My husband and I just inherited his grandmother's sewing machine. I had never sewn a thing in my life. We came across your blog and I had to tell you that even someone who has no idea what they are doing can follow your directions. Thank you. The children love their jammies that mommy made. What great tutorial! These were so quick and only took about forty minutes from start of pattern to my three year old putting them on! Thanks. Your blog is really cute. I absolutely love the ruffle detail on the legs and the monogram...super cute! Hi, Thanks so much for this FABULOUS tutorial. I've just finished my first pair for my 3 year old son, I love them so much. Has got me all excited for Christmas now! Thanks again, keep up the hard work, its very much appreciated. Do you finish your seams? I'm newer to sewing "clothes" and one of the pairs of cotton pants I made for my daughter that are kind of like this, pretty much fell apart in the wash. Then the pj pants I made for my sis in law out of flannel look like they could fall apart too (although I did zig zag those seams) Do you just sew with a standard straight stitch? Any advice you have would be more than welcome! :) I can't wait to try this tutorial- it looks way easier than the one I've been using! Thanks! Thanks guys! They are a really fun and quick project. Tori- I did not finish my seams. They do fray a bit durning the first few washes, and I think it would be a good idea to finish them, but my kids have worn these all year long and they are still holding up really well. I think it makes a difference in the quality of flannel you use. Riley Blakes flannel is a very good quality. I've used a less quality flannel before and they did not hold up as well. Also make sure you are using at least a 1/2 inch seam, instead of 1/4 inch like in quilting. Some patterns even call for 5/8 or 3/4. That may help, especially if they fray a bit. I'm going to try this. Thanks for sharing! Love it! Your tutorial is amazing and so easy to follow!! I will definitely use this and everyone will think that I am a pro! Thank you sooooooo much! i LOVE this tutorial i am definitely making these for the kids, thanks so much for taking the hard work out of xmas pj's! I would love to make some pants like this for myself. One problem, I am an adult so I don't know how much fabric I would need. Do you have a good estimate of what is needed? 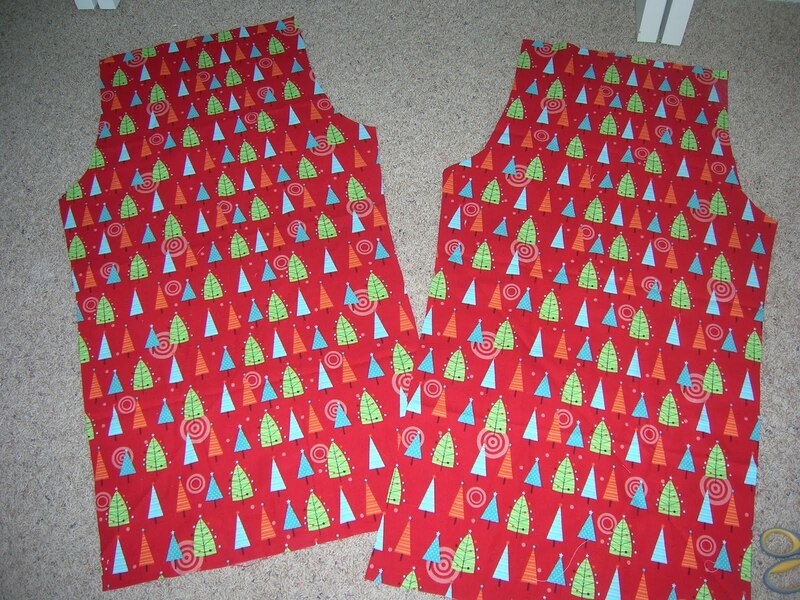 When my kids were little, I would always make them a new pair of flannel jammies for christmas as their "Santa Gift". They would wake up in the morning to a wrapped package outside their bedroom doors with new PJ's from "Santa", and a note to change into them before coming downstairs--extra 5 minutes of sleep for Mom, and nice new jammies for christmas morning pictures! I would love to make some pants like this for myself and my husband. Would just measure the same way to find out much fabric is need? Thanks so much for sharing. Hello!!! This is a great post.. 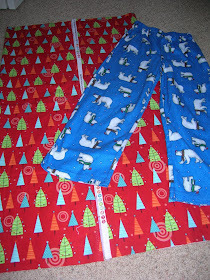 I have made pants many times before and this is one of the simplest and easy ways I have seen..
if making for an adult or a bigger child I would just measure the length of your template pants you and then add on the extra 4 inches for the wait and bottom hem..
its summer her so I am thinking about making a stack of shorts for the kids!! oohh a second though, the fabric might not be wide enough to make both legs out of one length..
hhmm would have to measure the width you need also, and if the fabric is not big enough to accommodate both legs, get twice the length in fabric.. So, I just perused you're entire blog looking for this post (my poor husband will be matching me and his daughter xmas morning, hahaha) and just wanted to say I love your stuff! you've some great ideas and your kids are super cute! Great Tute!! I have been sewing for years and this was the easiest and fastest pair of pants I have ever made! Actually made 2 pairs the night before Thanksgiving for my daughter to wear!! EASY Peasy!!! Thanks!!! I made these tonight in my adult size and they turned out nicely! Your instructions are so clear and easy to follow. Thank you! Went to Joann's, bought pj pattern, read it... Tossed it aside, came to this blog and made the most adorable pair of pj pants for my little guy in less time than it would have taken to cut out the pattern pieces!! Thank you for sharing your tutorial!! LOVE IT!! Well, I just wasted $24 by buying pj pants for my grown sons. Oh well! I thought your gas station gift buying nightmare was funny. We exchange names for stocking stuffing every year. 2 years ago my oldest son forgot he had to fill his Dad's stocking so had to shop at a gas station on Christmas eve. This year we are making it mandatory to shop at a gas station! Just thought you like to know!! These are absolutely adorable! I am having a Christmas Pajama Rama contest and would love for you to enter these! Thank you - that really helped! Perfection! Thank you for making my first clothes sewing project a piece of cake! I have the sweetest little girls that my mom and friends sew amazing clothes for, but I was determined to make them something by myself. Instructions were perfect for this momma who still needs to get her instruction manual out to remember how to thread the bobbin on her sewing machine. every. time. I used to sew all the time- bought jammie pattern! WHat a disaster! This is easy - took so little time- my grandsons will love them- thanks for saving the day! Merry Christmas to your family! First-time clothing sewer here as well, and I am soooo pleased with the results! So pleased that I am making another pair tonight! Thanks so much for the easiest, well-written instructions!!! Happy New Year! 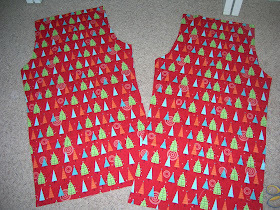 I used your tutorial to make 16 pairs of PJ pants for my kids, nieces and nephews for Christmas. Thanks for such great instructions! Here is the link to my pictures. This is a fabulous tutorial! Thanks! I used a pair of my old p.j. pants to make a pair for my one year old and they are so cute! I love this tutorial! I started sewing last week, and I think I will try these this weekend. But I am wondering how to sew a crotch opening for men's pants? I know my husband wouldn't even put on a pair of pants that didn't have one! I needed this so much. Thank You! I purchased polar fleece to make pants for hubby, but couldn't figure it out. This is wonderful, now I won't feel so lost when I start. I used to make this kind of pants all the time. An easier way to do it - is take each leg separately - sew the inseam. Then turn one leg right side out - put it inside the other leg - line up your seams then sew one continuous seam around the crotch from the top all the way around to the other side. 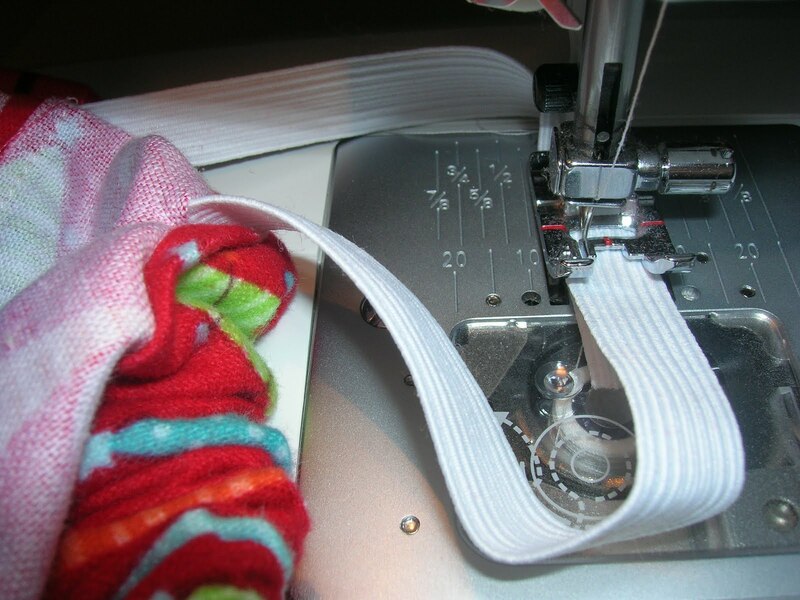 Pull the one leg out and you have a perfectly sewn set of pants ready to put the waistband in. This tutorial is AWESOME!! 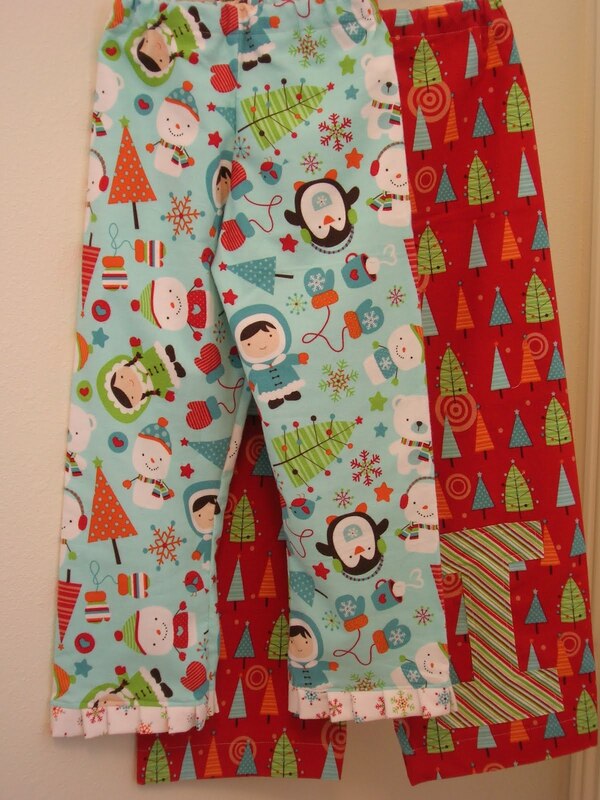 I used it to make pajama pants for my kids for Christmas - the first time I ever attempted something like it, and it worked so well and FAST! I'm addicted to making them pants and shorts now, thank you SO MUCH for such an easy to understand tutorial!!!! I was so excited to find this tutorial and so happy to see how easy it went, made some capris for my daughter using a pair she wears now as a pattern, and they are WAY too small, leave it to me to mess it up somehow! i can't get them over her hips! and ideas or tips on where i went wrong, maybe i need to cut larger when i cut out the pattern? i gotta perfect this cause it was way easier to do than the other pants patterns i have, HELP! 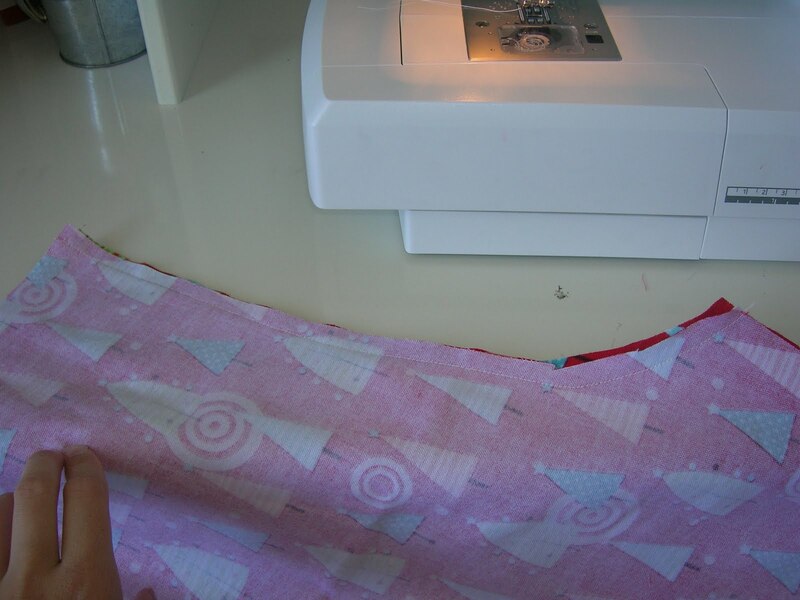 You'll need to make sure you leave a seam allowance, so cut them AT LEAST a half inch larger on all sides. It also depends a lot on the type of fabric used. 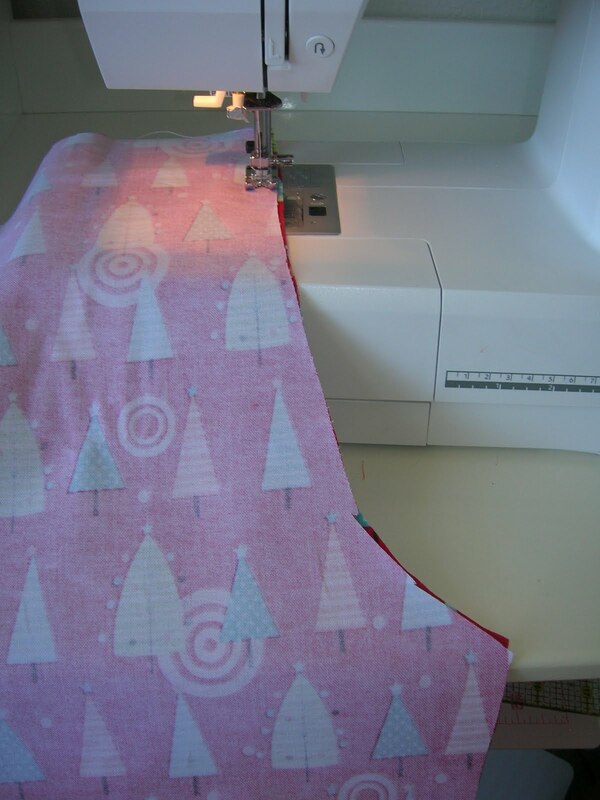 If your fabric has no stretch at all then you'll need to make them larger. For very small children without any hips it's pretty simple to make just straight leg pants that will fit, but as your child gets older, or for adults (especially women) you'll need to make a roomier seat and hips. I hope that helps, it's hard to know without seeing them myself. Make sure you leave a generous amount for the hips and waist band and let me know if that helps! Iust came across your blog & you are incredible with directions! you make it look super easy! cant wait til christmas (well i acually can b/c its begining of summer!) 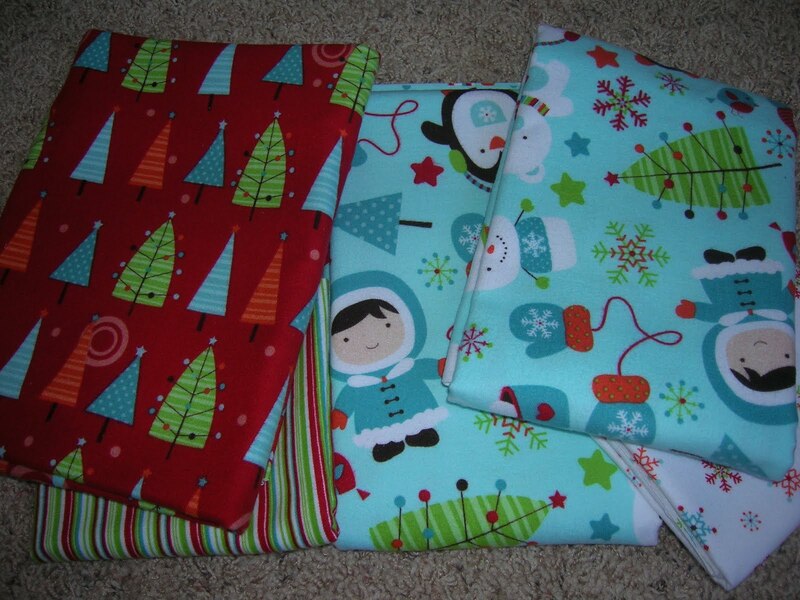 but i am definatly making christmas pj pants! i am super excited! Thanks! I need to make new scrubs...this works well for scrub pants as well!! I just added a "cargo" pocket on one leg!! Found you through Pinterest. I am SO excited to try this!!! Wow! I'm a novice at sewing, so I am excited to give this a go. I don't suppose you have a tutorial for PJ tops/shirts too do you? I was wondering about PJ tops too. But now I'm thinking it would be easier to just buy a t-shirt in a color that matches my fabric and make it a PJ set by cutting out some shape (like a big initial, or an airplane, etc.) from my fabric and sewing it onto the shirt. Just an idea. I'm new to sewing too, so the easier, the better! Another idea for a top - you can purchase iron-on transfer paper at the fabric stores, design an image on the computer and then print on the paper using your printer. Then, you just iron it on to the t-shirt top. The paper I bought was 7.99 for three full sheets and included a link to a (free!) website to help me create the image. Super easy. I was just going to ask about a top too! I can't wait to try these bottoms. 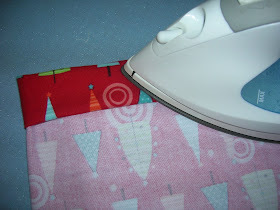 Great idea for making PJ pants even easier to make! Love! I would love to make some cartoon pajamas set for my kids. Nice of you to share some tutorials on these! I can't wait to make some superman pjs for them. I came across your tutorial on pinterest awhile back and finally got up the courage to try it! I'm a total novice and I had such a great time making them. I can't wait to see my little boy's face tomorrow morning. He's going to be thrilled. Thank you for such a great tutorial! Tonight I made a pair of these for my daughter, and they turned out adorable!! Thanks for this great tutorial. I Know what I'll be doing with my left over fleece and flannel! PJ's?? I'm going to make beach pants, lounging pants, shorts, pants for friends...thnx!! Oh my gosh...just made two pairs for my 4 year old son!!! so quick and easy. Love this tutorial! It's so easy! And I love quick projects that give me instant gratification! I've already made 9 pairs of pants since last Sunday night (2 each for my 3 kids and a pair for my 2 nephews and neice). Then I ran out of fabric. I've stocked up on some more cuddly flannel and am ready to try making a pair for myself and my hubby. I have a questions though. 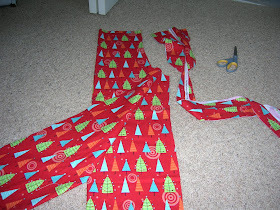 If I don't have a pair of pajama pants to use as a template, can I make one from their waist an inseam measurements? Any tips on this? 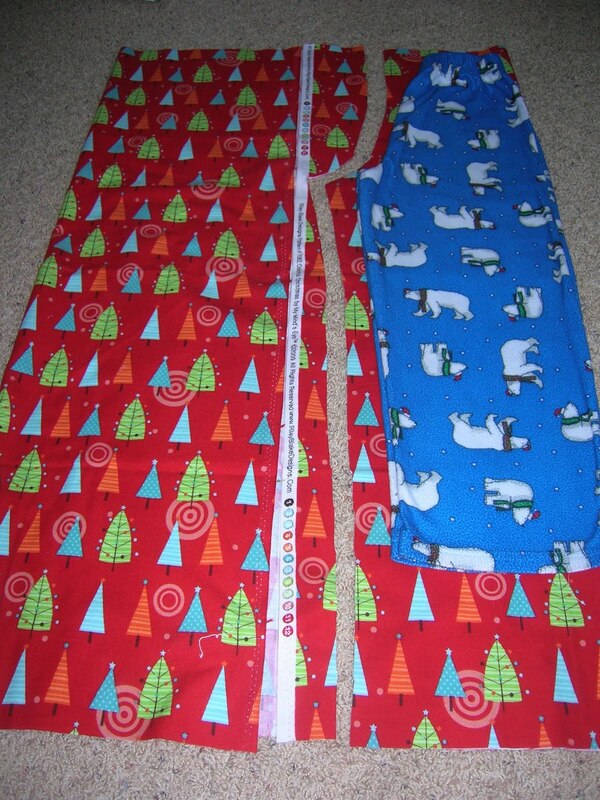 I'm hoping to make some Christmas jammies for my kids and their cousins, but some live far away so I'll just be getting measurements from their mom. Thank-you so much for such a simple tutorial and great pictures! 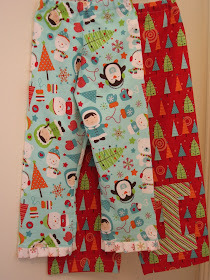 I have wanted to make pajama pants part of a Christmas tradition for my family but as a newbie to sewing I was never comfortable with it. I already made my 3 year-old pants and am in the middle of making a pair for my 2 year-old right now. They are the perfect fit and I am one happy momma! :) Thanks again! Thanks for the tutorial! Easy peasy - I whipped out a pair for my 16 month old yesterday. :o)I'm thinking I might try my husband and I next! Thank you SO MUCH for this tutorial! I have looked at so many & different tutorials & this one was the one that spoke to me. So much so that I have made 5 pair in less than 24 hrs & am getting ready to make two more. My kids are so proud & my husband wow'd since this is the first time EVER I have made PJ pants. I have wanted to every Christmas. As of today, my 4 kids have CUTE Christmas PJ's. Thank you, thank yoU! Wow! I can't wait to try this! Looks so easy and for someone like me who is sewing challenged - I think even I can do this! Thanks for the great tutorial!! I'm going to try this but in a shortie, it's summer here at Christmas time. Thank you so much for this tutorial! I made a pair of santa puppy p.j. pants for my son. He loves them! This was my 2nd sewing project ever. Thank you for the tutorial. I am trying this tomorrow! 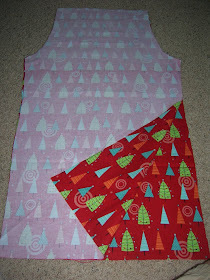 I just made a pair of jammie pants for my daughter tonight using your tutorial. It took me just under an hour and they turned out great! Thanks so much! Thank you, I'm going to try this! Both my daughters are leaving home after Christmas. One is going on a cruise ship to work for 9 months and the other is emigrating to the USA to be with her fiancée. These pjs will make perfect Christmas presents for them this year as money is tight but we want to have a fantastic family Christmas full of lovely memories. I shall be making some for my 11 year old son too but her will want pockets! Thank you so much for this pattern!!! I had decided to do pj pants for my son and nephews a while back for Christmas and was DREADING cutting out the pattern I had bought and the pants. Thanks to this, I got 3 pair cut out in less than an hour. SUPER EASY, especially for a sewing beginner like me! OMG I am so happy I found this tutorial on Pinterest! 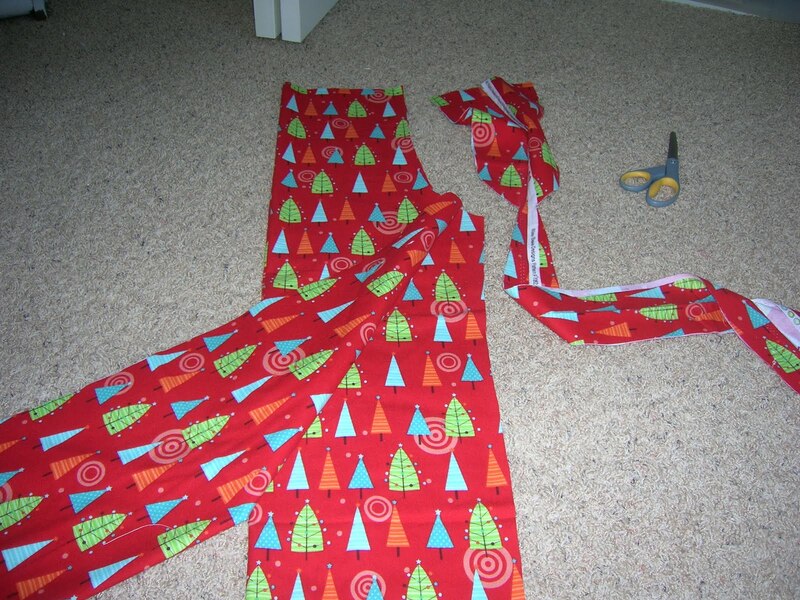 i have 3 pairs of christmas pants to make for my kids and dread cutting patterns etc.....this makes it soooo much easier!!! thanks for the step by step instructions they make more sense than the instructions on the patterns,, watch out family EVERYONES getting pj pants!!!! thanks again! Thank you so much for this post! I also found this on Pinterest & have just completed 4 pairs of PJ pants (2 for my adult brothers & 2 for my young boys). They turned out awesome!! I haven't sewn since High School so your tutorial brought it all back. Thanks again!! Found you at Pink Chalk ~ you've made my day and taken the mystery out of making pj's! Thanks so much for the great tutorial! hoo boy... just checking the directions... fabric cut... digging out the sewing machine now to put together a set for the hubs and I. Finished my kiddo's pants before Thanksgiving but then got sidetracked. Thanks for this! Has given this novice sewer a new found confidence! I made 5 pairs yesterday and today thanks to your tutorial! I will not lie, I should not have procrastinated, I was in such a hurry, I sewed my finger (OUCH!) but they turned out cute! Will be making them for other reasons now...thanks again! Thank you for the most complete tutorial I've ever seen, and I've seen plenty. Your pictures and directions are incredibly clear and concise. 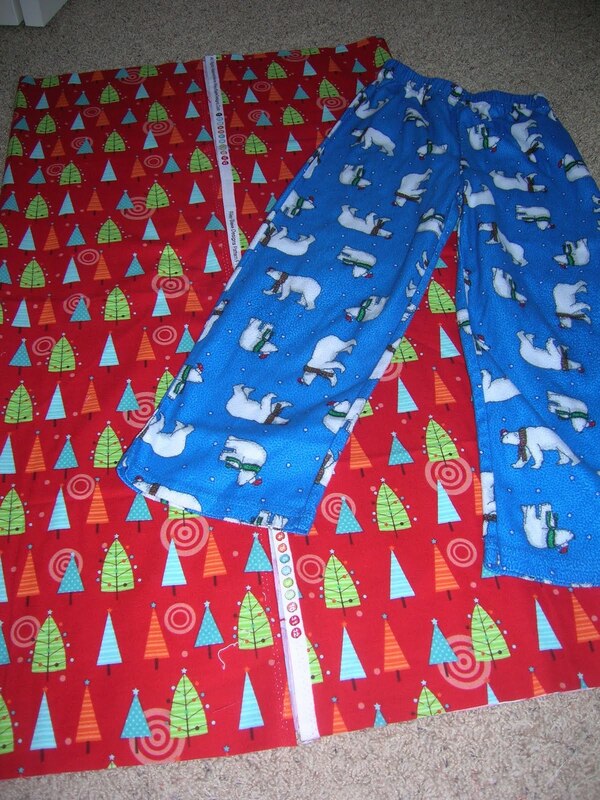 I'll be making jammie bottoms for my grandson, he is so skinny and tall that very little in the stores fit him. These pants will be perfect. Thanks again. I love this tutorial! The last time I attempted pj pants made me never want to do it again! I think I've changed my mind. The only thing I can't figure out is what is the best way to figure out the measurement on the elastic? Do you measure it while stretched out or not? I'm confused on that. I got a sewing machine for Christmas and this was my first project! I'm a women's size L and it was 3yrds of fabric for me. Love your instructions, they turned out great! This is a fantastic tutorial. The photos and instructions are clear for even the greenest sewer (like myself). I look forward to trying some for myself and my 3 children! I'm going to make these for myself and my doughter. I found your page yesterday and today I'm going to run to the store to get me some supplies. For the weist I'm going to use the bottom of a t-shirt (in dutch 'hemd'). What a great tutorial, I'm hoping to see more tutorials from you. Thanks! Such an easy and straightforward tutorial. I started a pair for my son at 9.30 at night, and they were pretty much finished in time for my bed time of 10.15! Great tutorial. My daughter makes pj pants for everyone every year for Christmas, she started doing it when she was 15 and now is 20. I appreciate you for making effort in building this. 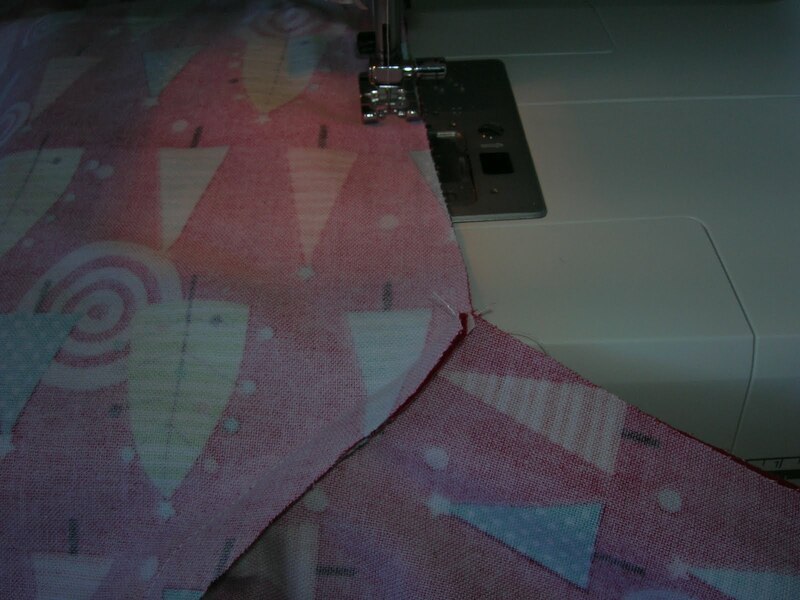 Have you ever tried sewing up the leg/inseam first, then turning one inside out and pinning un-sewn seam together? It's super easy for me that way. Thank you for sharing looks like one of the easiest ideas I've seen! I wonder if you can do shorts the same way!!! Tutorial time. !!!! I am definitely doing this for all of my four little kids this year! (and for me and the hubby, too :) I think it would be cute to make matching pillow cases to make a gift set... and then a doll version for AG dolls that my girls have with matching cases for their doll beds also. So much fun! Thanks for this easy tutorial! I made these as my first pair of sewn pants last night. The tutorial was great! My pants came out pretty good, but a bit crooked. Totally my fault though, since I'm kind of new at sewing. Thanks for the awesome tutorial! I've just sewn my first ever pair of PJ pants and they came out really well. My son is an Aussie size 10-12, but he's tall and real,y skinny, so I was hoping these would work. His normal PJs are about an inch too wide, but really baggy on him, so I just got away with it. I didn't even bother hemming them as I'd already overlocker my edges before prewashing. I'll hem the next pair, but he was in a big hurry for these pants! I made a pair of these for my hubby for Father's Day. I used cotton material and they kind of stick out in the front. Anybody have insight as to why that might happen? Im gonna try it tommorow. I love Love LOVE this tutorial! 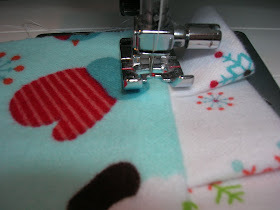 I am 15, I am making PJ pants for everyone in my family for my Divine Nature project. My cute little brother has a bigger rounder bum, and after sewing these PJ pants for him, it was tighter around that area. What am I doing wrong? How do I make it wider around the hips and bum? This tutorial is AWESOME!! I used it to make peppa george pyjamas pajama pants for my kids for Christmas - the first time I ever attempted something like it, and it worked so well and FAST! I'm addicted to making them pants and shorts now, thank you SO MUCH for such an easy to understand tutorial!!! !